I've only been blogging for a little while; already I find the idiosyncrasies of the Blogger / Blogspot interface frustrating. 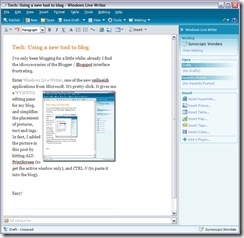 Enter Windows Live Writer, one of the new onlineish applications from Microsoft. It's pretty slick. 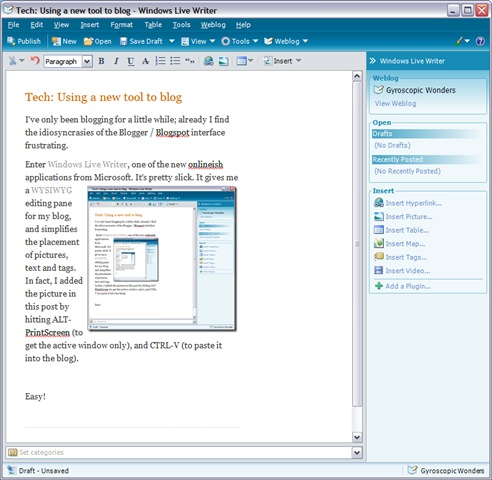 It gives me a WYSIWYG editing pane for my blog, and simplifies the placement of pictures, text and tags. In fact, I added the picture in this post by hitting ALT-PrintScreen (to get the active window only), and CTRL-V (to paste it into the blog).